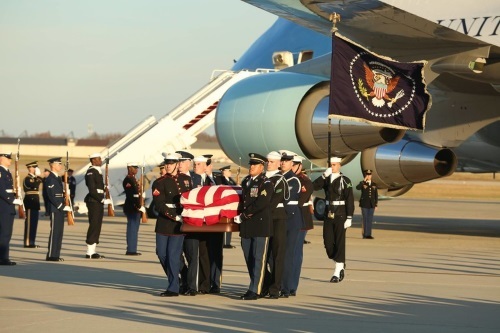 The funeral service for President H. W. George Bush, held Dec. 5 in the nation’s capital, evoked many memories of the 41st president’s one term in office – especially his impact on transportation, via the Intermodal Surface Transportation Efficiency Act. On the morning of December 18, 1991, President H. W. Bush signed ISTEA into law at a construction site on State Highway 360 in Euless, Texas – legislation considered “the most sweeping and significant restructuring of U.S. surface transportation programs” since the creation of the Interstate Highway System in 1956. “This bill will launch the post-interstate era of America’s surface transportation system,” President H. W. Bush said at the time, in part as ISTEA strongly emphasized “intermodalism” so various modes of transportation could work more efficiently together. “It will enable us to build and repair roads, fix bridges, and improve mass transit; keeps Americans on the move, and help the economy in the process,” he added. President H. W. Bush taking the oath of office. Photo via Wikimedia Commons. ISTEA also gave unprecedented flexibility to state and local governments to come up with the best mix of transportation projects regardless of the particular modes involved and to allow states to spend their Highway Trust Fund grants accordingly. Other key ISTEA provisions included: Allocating a portion of funds to further develop such new technologies as prototype magnetic levitation systems and what is now known as Intelligent Transportation Systems; directing other funds towards the enhancement of the environment through wetland banking, highway beautification efforts, the mitigation of damages to wildlife habitats, the attainment of national ambient air quality standards, an emphasis on bicycling and walking as mobility alternatives, and various other activities; and launching a program to promote the use of seat belts and motorcycle helmets. President H. W. Bush also emphasized the broader role transportation plays in American life during a speech before the policy committee of the American Association of State Highway and Transportation Officials at the Hyatt Regency Hotel in Dallas shortly after the ISTEA signing ceremony. President H. W. Bush’s funeral train. Photo by Union Pacific. Frederick “Bud” Wright, AASHTO’s executive director, recalled being part of the Federal Highway Administration team attending the ISTEA signing ceremony back in 1991. President H. W. Bush also highlighted the importance of the relationship between the federal government and the states when it comes to transportation in an earlier Rose Garden speech on June 21, 1991, as ISTEA was wending its way through Congress. President H. W. Bush in 1989. “The old approaches to surface transportation just won’t do it. And by any standard, the way in which we, the Federal Government, and you, the States, do business must change in response to new fiscal and technological challenges,” the president said at the time. And it was the president’s leadership in shepherding ISTEA into law as well as his overall support for transportation that drew praise from USDOT Elaine Chao at his funeral. “With the passing of President George H.W. Bush, our country has lost a heroic patriot, distinguished statesman and loving patriarch of an eminent American family, who dedicated his life to serving others,” she noted in a statement on Dec. 4.